FreakOut Mobile, Native, Banner advertising network details. 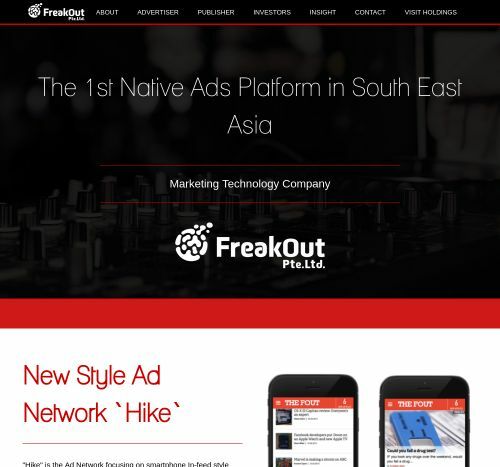 FreakOut is the first Native Ads Platform in South-East Asia and provides Marketing Technology solutions for Advertisers and Publishers. The platform was founded in 2010 and was launched as the first Demand-Side Platform in Asia. Their user-friendly platform makes it easy to implement a campaign which will fit perfectly with your media content. If you choose to be an Advertiser with FreakOut, you will have simple, well-designed native ads which appear in between the publisher’s feed. If you choose the Publisher side, you get to maximize your mobile earnings with the use of Native Ads. Check the reviews on Affbank about FreakOut and for any details regarding their Target Audience, Pricing Models and Advertising Formats, reach the Information section. If you choose to join the FreakOut Network, you can do that by clicking on - Join Now! Once you create an account, you will get in touch with an experienced Team who will give the best to help you reach your goals with FreakOut.